IMPORTANT Read The Letter Below BEFORE You Use Your Qualified Lead Blueprint (Please allow 10 - 15 Minutes for delivery). Lead Quality > Lead Quantity. This is proof that you don't need thousands of leads to generate thousands of dollars in brand-new revenue for your brick and mortar business. Are You Sick Of Pouring Resources Into Facebook, Only To See Little Or No Results For Your Bottom Line? There's a hard truth about Facebook marketing that few "industry experts" are talking about. It doesn't matter how hard you've worked to generate an audience on your Facebook fan page. 300 or 300,000 Likes on Facebook, it doesn't just doesn't matter. Likes do NOT equate to real world profits, period. Even if you were once able to generate enough traffic to "move the needle" from your Fan page, you're probably feeling the squeeze from all sides..
We did too, and so did our community of 20,000+ businesses! It felt like each and every day, getting anything out of Facebook was a harder task to accomplish. ...something had to change, and change fast. By Facebook's own admission, the value of a branded "Like" has plummeted to near zero across the entire network. You've even gone so far as to kill off "Like Gates" in a hail mary effort to salvage what little value is remaining. All while pummeling the reach (the number of people who see your content) into the 1% range.. useless. To say that social agencies have been scrambling would likely be the understatement of the year. Time for a new approach. The role of "Fan Pages" in 2015 has completely changed. For many, these facts about Facebook feel downright scary. We completely understand where you're coming from. Change is never easy, but sometimes what feels jarring can actually be a MASSIVE blessing in disguise. With the role of Fan Pages changing dramatically, we can refocus on the fundamentals. Generating qualified leads and them into converting customers. Everything else has been a distraction up until this point. The allure of organically building up a fan base on Facebook that would then directly buy from you has died. In a lot of ways, it never really existed to the extent we were sold on it anyway. Now that Facebook has forced our hand, we can get results that are simply better than they've ever been since Facebook has been around as a platform. Far better than when things were "free". So don't panic or over-react. We're going to show you some examples of brick and mortar companies who are absolutely killing it online with Facebook in this new era. Any good sales process lives and dies on their flow of leads. However, not all leads are created equal.. some convert into sales like crazy, while others are more like oil and water... they just don't mix. 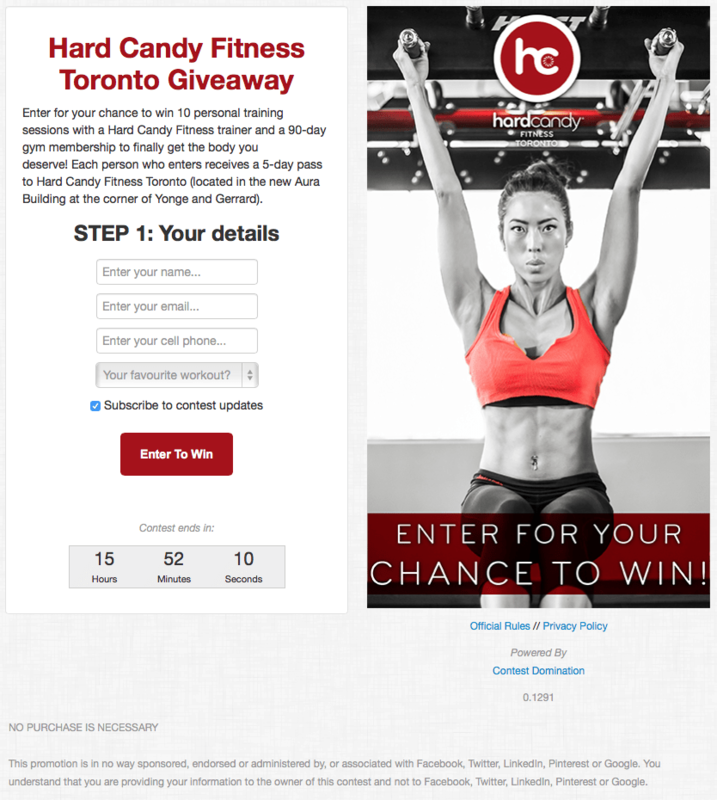 A local gym was able to craft the perfect contest prize that generated highly qualified leads who wanted exactly what they sell as their go-to solution. If you "only get one thing right" when setting up a contest, the prize is where you want that to happen. Many get tripped up on this step, but you're not alone.. we've all been exposed to poorly run contests by big brands that would lead you towards the wrong goals. In fact, if you stopped 100 people on the street and forced them to come up with a prize.. I'm willing to bet that at least 90 of them would say something like "An iPhone, iPad etc". Which, unless you're a technology blog.. or electronics retailer like Best Buy this is the WORST POSSIBLE PRIZE you could choose when it comes to your prize. A contest prize exists to excite your ideal customer enough to enter their information into a form.. and then your referral structure should give them enough incentive to refer like minded people from their personal network. If a prize doesn't explicitly interest your ideal customer profile, you've failed. Since an iPad does absolutely nothing to pre-qualify someone to care about working out, the kind of people who would enter would be all over the place.. and their reason for sharing wouldn't be in-line with fitness goals. However, since the gym gave away personal training time.. it explicitly appeals to those who are interested in getting in better shape. Forget everything you've been "taught" by those who claim that you must chop down your entry form to the absolute bare minimum number of fields to convert leads. The theory of less stems from the idea that more fields = more friction. More often, it significantly helps bolster the value of the leads by asking them to answer a pre-qualifying question and/or including a phone number for a sales rep to reach out to them. For this particular local gym, they asked for Name, Email, Cell Phone # and their favorite workout (such as yoga, strength training etc). This gives their team a way to contact the prospect via email, phone AND know the "hot button" area of interest to focus on when asking them about their fitness goals. Company Sold $34,000 in product. However, not all leads are created equal.. some convert into sales like crazy, while others might avoid you like the plague. Convert those leads into raving fans who become CUSTOMERS and generate revenue from social. In other words, you'll finally turn Facebook into the QUALIFIED LEAD MACHINE everyone thought it would be! You can keep doing what isn't working, or you can try something new. …you’re learning from all sized ad spends, industries and experience levels. You see, our platform has often times generated life changing results for the solo entrepreneurs and startups who have used us. But we’ve also helped major brands like Affliction Clothing, Family Dollar, DeWalt and more apply the same model to gigantic industries. Your plan will be all meat and no fluff. If you want character building, that’s why we have blog posts. These plans are all about taking action and getting results as quickly as possible. 2. It weeds out the freebie-seekers. We only want serious marketers who take action, and in our experience charging anything… even if it’s just a buck… gets rid of 99% of the time-wasters. 3. We tested it, and $10 generated the best overall ROI. Not just in terms of revenue, but actually getting some skin in the game so people consume the content and take action. We also believe that once you experience this Execution Plan, you’ll want more and maybe… just maybe… you’ll come back, buy more and even upgrade to more advanced products and training. No fine print… no “hidden trials”… no shenanigans. Just the information you need and the results you want for your business. Absolutely… all our trainings have a 30-day, no-questions-asked guarantee. To put it simply, if you aren’t happy with the information or tools we provide then we don’t deserve to have your business. If you aren’t happy for any reason, just let us know and we’ll give you your money back. Of course, we don’t think it will come to that, but if you’re even the least bit concerned about this training working for you, then we want to take out all the risk. You either get the results you want or you get your money back, period. Your login and access information will be sent to the email address you provide, and there will be a video on the next page that explains how you can pair this training with software to fast track your progress. If you don’t get the information right away, just let us know and we will make sure you get access right away. Don’t forget to check your spam and other folders in case the email was simply filtered. Act now and jump start your progress towards more sales. ...all for just $67 $10. (Save 85%!!) Click the "Add To Cart" button for INSTANT ACCESS! No Thanks! I'm not interested in generating sales for my brick and mortar business. I just want my Qualified Lead Blueprint.